Cardamom (/ˈkɑːrdəməm/), sometimes cardamon or cardamum, is a spice made from the seeds of several plants in the genera Elettaria and Amomum in the family Zingiberaceae. Both genera are native to the Indian subcontinent and Indonesia. 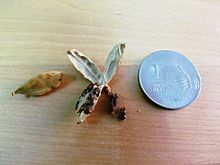 They are recognized by their small seed pods: triangular in cross-section and spindle-shaped, with a thin, papery outer shell and small, black seeds; Elettaria pods are light green and smaller, while Amomum pods are larger and dark brown. Species used for cardamom are native throughout tropical and subtropical Asia. The first references to cardamom are found in Sumer, and in the Ayurvedic literatures of India. Nowadays, it is also cultivated in some other countries, such as Guatemala, Malaysia and Tanzania. 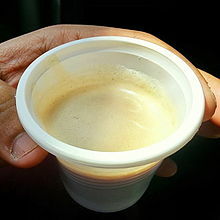 The German coffee planter Oscar Majus Kloeffer introduced Indian cardamom (kerala) to cultivation in Guatemala before World War I; by 2000, that country had become the biggest producer and exporter of cardamom in the world, followed by India. Cardamom is the world's third-most expensive spice, surpassed in price per weight only by vanilla and saffron. The word "cardamom" is derived from the Latin cardamomum, which is the Latinisation of the Greek καρδάμωμον (kardamomon), a compound of κάρδαμον (kardamon), "cress" + ἄμωμον (amomon), which was probably the name for a kind of Indian spice plant. The earliest attested form of the word κάρδαμον signifying "cress" is the Mycenaean Greek ka-da-mi-ja, written in Linear B syllabic script, in the list of flavourings on the "Spice" tablets found among palace archives in the House of the Sphinxes in Mycenae. The modern genus name Elettaria is derived from the local name. The root ēlam is attested in all Dravidian languages viz. Kannada elakki (ಏಲಕ್ಕಿ), Telugu yelakulu (యేలకులు), Tamil elakkai (ஏலக்காய்) and elakka (ഏലക്കായ്) in Malayalam. The second element kai means "seed" or "fruit". The Malabar region had historical trade connections and was a prominent area of cardamom cultivation. A related root is also present in Hindi elaichi (इलायची), Bengali ælachi (এলাচি), Sylheti elasi (ꠄꠟꠣꠌꠤ) and Punjabi elaichi (ਇਲੈਚ) "green cardamom". In Sindhi, it is called photta. In standard Afghan Pashto, it is called Hel. In Sanskrit, it was known as ela (एला) or ellka (एल्ल्का). In Marathi, it is commonly known as velchi (वेलची) or veldoda (वेलदोडा). In Sri Lanka, the plant is known as enasal in the Sinhala language. True or green cardamom (or when bleached, white cardamom) comes from the species Elettaria cardamomum and is distributed from India to Malaysia. What is often referred to as white cardamon is actually Siam cardamom, Amomum krervanh. Black cardamom, also known as brown, greater, large, longer, or Nepal cardamom, comes from species Amomum subulatum and is native to the eastern Himalayas and mostly cultivated in Eastern Nepal, Sikkim, and parts of Darjeeling district in West Bengal of India, and southern Bhutan. The two types of cardamom, κάρδαμομον and ἄμωμον, were distinguished in the fourth century BCE by the Greek father of botany, Theophrastus. Theophrastus and informants knew that these varieties were originally and solely from India. Both forms of cardamom are used as flavourings and cooking spices in both food and drink, and as a medicine. 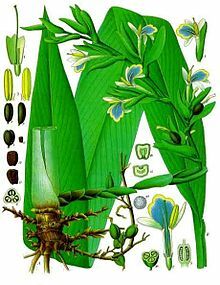 E. cardamomum (green cardamom) is used as a spice, a masticatory, and in medicine; it is also smoked. Besides use as flavourant and spice in foods, cardamom-flavoured tea, also flavoured with cinnamon, is consumed as a hot beverage in Bangladesh, India, Nepal, and Pakistan. Cardamom has a strong, unique taste, with an intensely aromatic, resinous fragrance. Black cardamom has a distinctly more smoky, though not bitter, aroma, with a coolness some consider similar to mint. Green cardamom is one of the most expensive spices by weight but little is needed to impart flavour. It is best stored in the pod, as exposed or ground seeds quickly lose their flavour. Grinding the pods and seeds together lowers both the quality and the price. For recipes requiring whole cardamom pods, a generally accepted equivalent is 10 pods equals ​1 1⁄2 teaspoons of ground cardamom. It is a common ingredient in Indian cooking. It is also often used in baking in the Nordic countries, in particular in Sweden, Norway, and Finland, where it is used in traditional treats such as the Scandinavian Jule bread Julekake, the Swedish kardemummabullar sweet bun, and Finnish sweet bread pulla. In the Middle East, green cardamom powder is used as a spice for sweet dishes, as well as traditional flavouring in coffee and tea. Cardamom is used to a wide extent in savoury dishes. In some Middle Eastern countries, coffee and cardamom are often ground in a wooden mortar, a mihbaj, and cooked together in a skillet, a mehmas, over wood or gas, to produce mixtures as much as 40% cardamom. In Asia, both types of cardamom are widely used in both sweet and savory dishes, particularly in the south. Both are frequent components in spice mixes, such as Indian and Nepali masalas and Thai curry pastes. Green cardamom is often used in traditional Indian sweets and in masala chai (spiced tea). Both are also often used as a garnish in basmati rice and other dishes. Individual seeds are sometimes chewed and used in much the same way as chewing gum. It is used by confectionery giant Wrigley; its Eclipse Breeze Exotic Mint packaging indicates the product contains "cardamom to neutralize the toughest breath odors". It is also included in aromatic bitters, gin, and herbal teas. In Korea, medicinal cardamom (Amomum villosum var. xanthioides) and black cardamom (Amomum tsao-ko) are used in traditional tea called jeho-tang. The content of essential oil in the seeds is strongly dependent on storage conditions, but may be as high as 8%. In the oil were found α-terpineol 45%, myrcene 27%, limonene 8%, menthone 6%, β-phellandrene 3%, 1,8-cineol 2%, sabinene 2% and heptane 2%. Other sources report 1,8-cineol (20 to 50%), α-terpenylacetate (30%), sabinene, limonene (2 to 14%), and borneol. In the seeds of round cardamom from Java (A. kepulaga), the content of essential oil is lower (2 to 4%), and the oil contains mainly 1,8-cineol (up to 70%) plus β-pinene (16%); furthermore, α-pinene, α-terpineol and humulene were found. By the early 21st century, Guatemala had become the largest producer of cardamom in the world, with an average annual yield between 25,000 and 29,000 tonnes. The plant was introduced there in 1914 by Oscar Majus Kloeffer, a German coffee planter. India, formerly the largest producer, since 2000 has been the second worldwide, generating around 15,000 tonnes annually. Increased demand since the 1980s, principally from China, for both A. villosum and A. tsao-ko, has been met by farmers living at higher altitudes in localized areas of China, Laos, and Vietnam, people typically isolated from many other markets. ^ Weiss, E. A. (2002). Spice Crops. CABI. p. 299. ISBN 978-0851996059. ^ Weiss, E. A. (2002). Spice Crops. CABI. p. 300. ISBN 978-0851996059. ^ a b Shenoy Karun, Kerala cardamom trying to fight off its Guatemalan cousin", The Times of India, 21 April 2014; accessed 25 July 23014. ^ Williams, Olivia (2014). Gin Glorious Gin. London: Headline Publishing Group. p. 283. ISBN 978-1-4722-1534-5. ^ Burrow, Thomas; Emeneau, M. B. A Dravidian Etymological Dictionary. Retrieved 2 August 2014. ^ "cardamom - translation - English-Marathi Dictionary - Glosbe". Glosbe. ^ Bhide, Monica. "Queen of Spices", Saveur, 8 March 2010. Retrieved on 4 December 2014. ^ Katzer, Gernot. "Spice Pages: Cardamom Seeds (Elettaria cardamomum)". gernot-katzers-spice-pages.com. Retrieved 4 April 2017. ^ "The Uses of Cardamom". Garden Guides. 21 September 2017. Retrieved 29 May 2018. ^ "Is Cardamom a Spice?". The Spruce Eats. Retrieved 29 January 2019. ^ see Farooq Anwar, Ali Abbas, Khalid M. Alkharfy, Anwar-ul-Hassan Gilani (2015). Cardamom (Elettaria cardamomum Maton) Oils. In Victor R. Preedy, (Ed.) (2015) Essential Oils in Food Preservation, Flavor and Safety. Amsterdam: Academic Press. ISBN 978-0-12-416641-7. Chapter 33 (pages 295-301). doi:10.1016/B978-0-12-416641-7.00033-X. ^ a b Álvarez, Lorena; Gudiel, Vernick (14 February 2008). "Cardamom prices leads to a re-emergence of the green gold". El Periodico (in Spanish). ^ Batres, Alexis (6 August 2012). "Looking for new markets". El Periodico (in Spanish). Guatemala. Archived from the original on 19 April 2014. ^ Buckingham, J.S. & Petheram, R.J. 2004, Cardamom cultivation and forest biodiversity in northwest Vietnam, Agricultural Research and Extension Network, Overseas Development Institute, London UK. ^ Sarah Turner, Christine Bonnin, and Jean Michaud (2017) Frontier Livelihoods: Hmong in the Sino-Vietnamese Borderlands. Seattle: University of Washington Press. Pp. 104-124. ^ Aubertine, C. 2004, Cardamom (Amomum spp.) in Lao PDR: the hazardous future of an agroforest system product, in 'Forest products, livelihoods and conservation: case studies of non-timber forest products systems vol. 1-Asia, Center for International Forestry Research. Bogor, Indonesia. Wikimedia Commons has media related to Elettaria cardamomum.